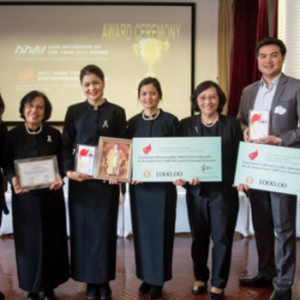 Congratulations to Khun Pattaraporn Kanyame, CEO of The Little Onion Factory Co. Ltd., MUIC Class of 2006, for receiving the 2017 AABI Torch Award for Promising Entrepreneur during the 23rd AABI General Assembly. The award was given by Asian Association of Business Incubation (AABI), which was held in Shanghai, China on October 24-27, 2017. The AABI Torch Entrepreneur Awards aims to promote entrepreneurial activities by honoring an entrepreneur in an incubation program at AABI member countries or territories who has developed an outstanding innovation. We are so proud of you!